The Suburban’s transmission has been upgraded with a new braking mode to help reduce excessive brake wear on long steep descents. If you’re looking for a serious truck-based SUV with the capability to haul nine passengers and still have enough cargo room to bring along all their luggage, equipment, or toys – then the Suburban is right up your alley. One particular feature that makes this SUV more appealing to some customers than a van or a competing SUV is the Suburban’s towing capability. The Suburban offers every luxury amenity you can think of, and with the heavy-duty towing package, you really can have it all. 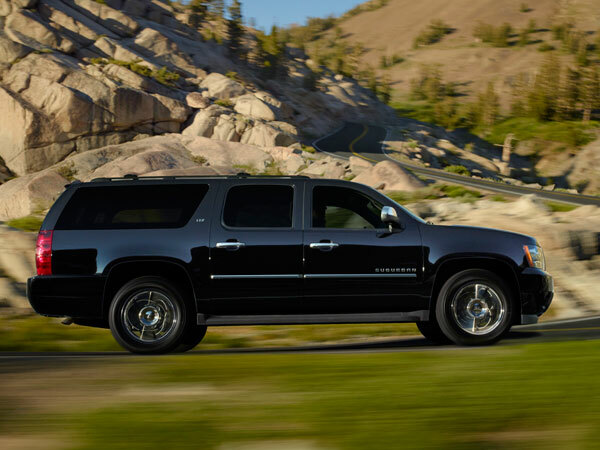 The Suburban 1500 is powered by a 5.3-liter V8 that creates 320 hp and 335 lb-ft of torque, while the Suburban 2500 has a 6.0-liter V8 which puts out 352 hp and 382 lb-ft of torque, making this one mean machine. Properly equipped, the Suburban 2500 can tow up to 9,600 pounds, the best in its class. The EPA-estimated fuel economy for the 2013 Chevrolet Suburban is 17 mpg in combined driving for two-wheel-drive 1500 models and 12 mpg combined for the four-wheel-drive 2500. Fuel efficiency isn’t the Suburban’s thing, but depending on your lifestyle, the benefits may outweigh the cost. The Suburban’s interior features gauges and controls which are functional, organized, and are easy to read. When it comes to seating capacity, no other full-size SUV compares with the Suburban’s option for a front bench seat, making the total possible passenger count nine. In order to make the most use of the cargo space in the back, you can remove the third row of seats -doing so reveals an incredible 137 cubic feet. Standard safety features include four-wheel anti-lock disc brakes, stability control, front side airbags and full-length side curtain airbags. In government crash tests, the Suburban earns four out of five stars. Jason Fischbein is the General Manager at Ted Britt Chevrolet in Sterling, VA. He’s from Potomac, MD and graduated from the University of Maryland in College Park. He is an avid Wizards and Redskins fan, and enjoys spending time with his two children and family. Jason has been in the auto industry since 1987, and is proud of his staff at the all-new Ted Britt Chevrolet. The dealership has only been open since September 2012 and is already a DealerRater 2014 Dealer of the Year!